The lack of electricity is hindering development for billions of people, especially in countries of the Global South. Several studies and reports show that this can be reversed if countries turn to decentralised renewable energy. It can reach communities much faster than expanding existing, inefficient central grid systems. New business models emerge and it offers immediate improvements to people’s lives. One example is the Senegalese village Sine Moussa Abdou. In 2010, it was the dawn of a new era: with an electric sewing machine, the tailor can now earn six times his previous income, the school has bought a computer, a group of women are planning to open a village shop with a refrigerator and it is hoped the village will soon see the arrival of the internet. Electricity supply to the remote village is reliable and much more secure than in the towns and cities, where power outages are an almost daily occurrence. The operator is the German company INENSUS that has developed a business model labeled “Micro Power Economy”. Micro Power Economy provides a reliable energy access to remote villages in West Africa while at the same time generating profit. The company installs island grids that run on renewable energy (wind and sun) and only rely on a diesel generator for peak demand. As demand rises, supply can grow with it as the system is modular. 60 % of the investment is provided by INENSUS. The remaining 40 % is financed through microfinance organizations as well as donations from international donors. On top of the condition to have a microfinance organization on board, the village itself must show commitment to the project. The villagers participate in the planning process by forming an energy committee. The committee will then biannually negotiate the contracts determining the electricity price and the volume of energy. In addition, one villager is trained to keep the grid running. End customers prepay their monthly electricity with a pay card, which allows the provider to monitor demand in advance and provide the appropriate amount of energy. In 2010, the Senegalese village Sine Moussa Abdou was electrified as the first model village. From the companies’ perspective, the deal is quite profitable: the return on investment is 10 -15 %, twice as much compared to European electricity providers. For the villagers, access to electricity is a game-changer. Small businesses like that of the local tailor have quickly multiplied their revenue, children are improving in school as they can do their homework after dark and new business ideas are quickly developing. The business model has received multiple awards and will now be applied on a larger scale in Tanzania. 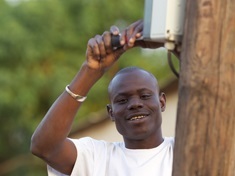 More than 81.000 people living in 16 villages are expected to gain access to electricity. Especially given that many attempts to electrify rural areas have failed in the past, this is an inspiring development that has the potential to improve the lives of many citizens through mainly renewable energy.